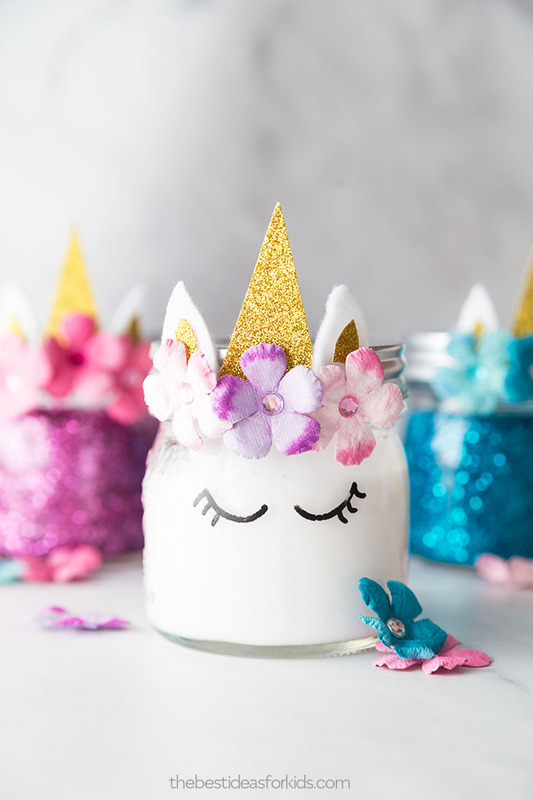 If you’re looking for a fun unicorn party activity idea or unicorn favor idea – these unicorn slime jars are so fun to make! They would also make a great gift idea for the unicorn fan. 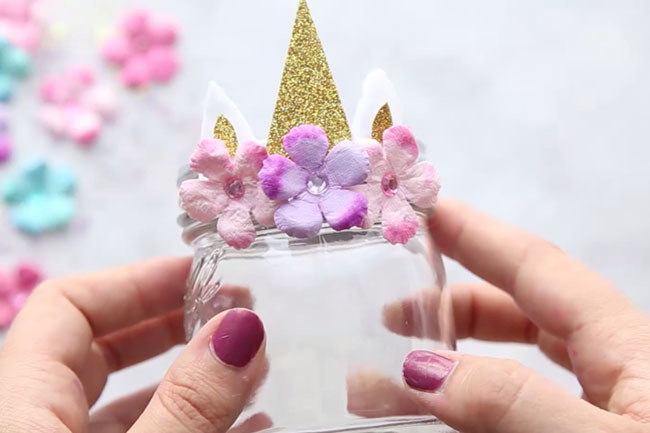 You can easily make these unicorn mason jars and fill them with anything. However, turning them into unicorn slime jars is a lot of fun and then you can re-use the jars after or keep them to store your slime. 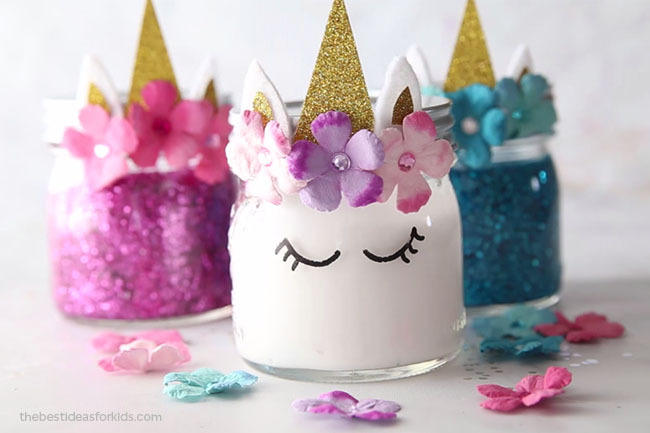 If you don’t want to put slime inside these unicorn mason jars you can paint the outside of the jar instead. Be sure to apply a spray primer to make the painting easier (we like this brand). 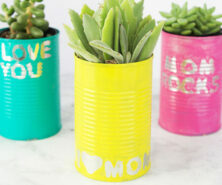 Adults should apply the primer and then kids can help paint the jars. If you want to put slime inside you can buy slime or make your own homemade slime. First we’ll show you how to make the unicorn mason jars. You can make one with eyes or without eyes. We like both versions! The one with the unicorn eyes we put white slime inside and the plain ones we added some glitter slime inside. 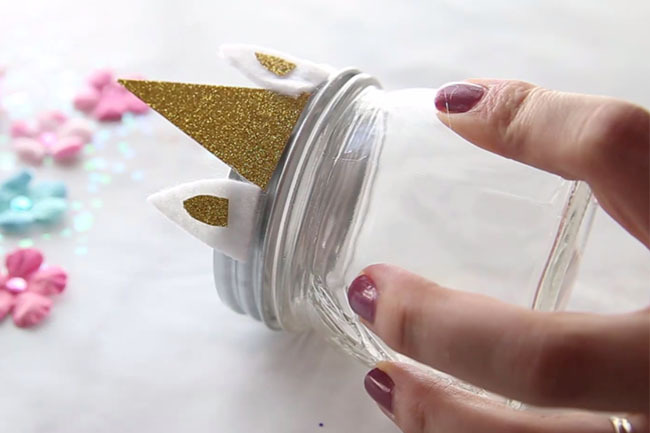 First, let’s walk through the steps to make your unicorn mason jars. 1. 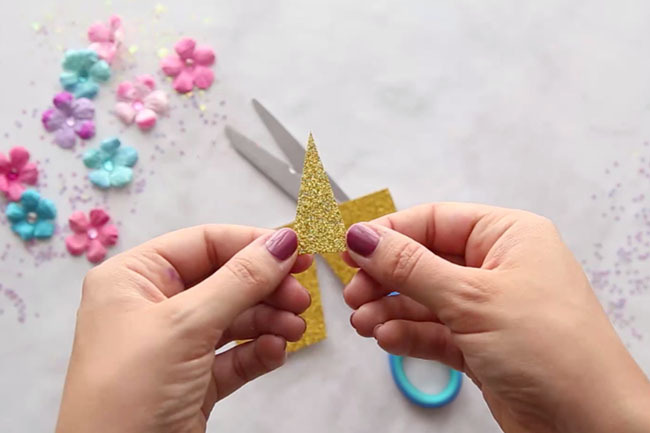 Cut out a horn from your gold glitter paper. Glue this to the lid of the jar. You can use either glue dots or hot glue (adults only). Tip: Make sure you glue when the lid is on since when you put it back on you’ll want to make sure it is lined up to where you want to draw your eyes. 2. Make your unicorn ears by cutting out small ears from white felt. 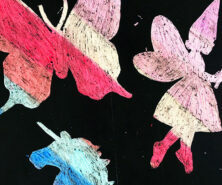 Then cut out an inner piece from your gold glitter paper and glue this to the felt. Glue the ears to your lid using glue dots or hot glue (adults only). 3. Then glue on your paper flowers. We found paper flowers that already had rhinestones on them and we loved the way this looked. If your paper flowers don’t have small rhinestones in the center you can buy these separately and glue them on. Glue on your flowers with glue dots or hot glue (adults only). 4. If you’re making the white slime jar, the final step is to draw on your eyes. Use an oil-based paint pen or sharpie to draw on the eyes. Now to make the slime that will go inside your jar! 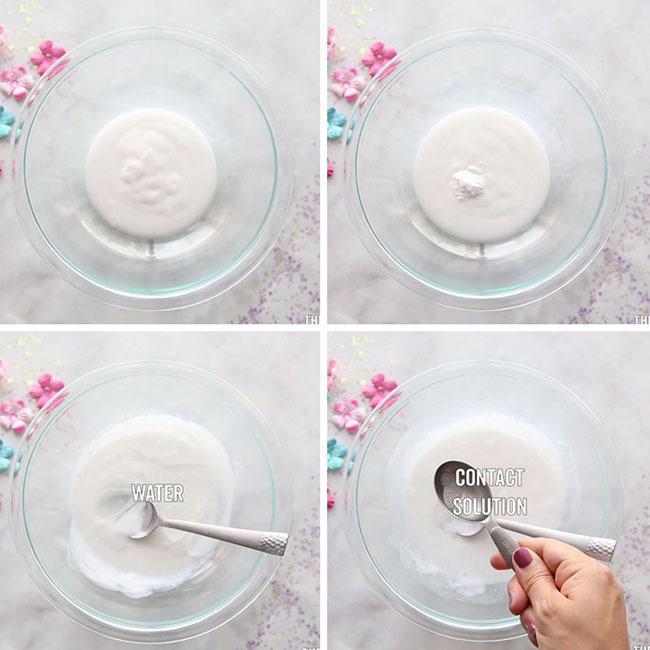 We have two easy to follow unicorn slime recipes we have linked at the bottom of this post. We’ll walk you through how to make the white slime. 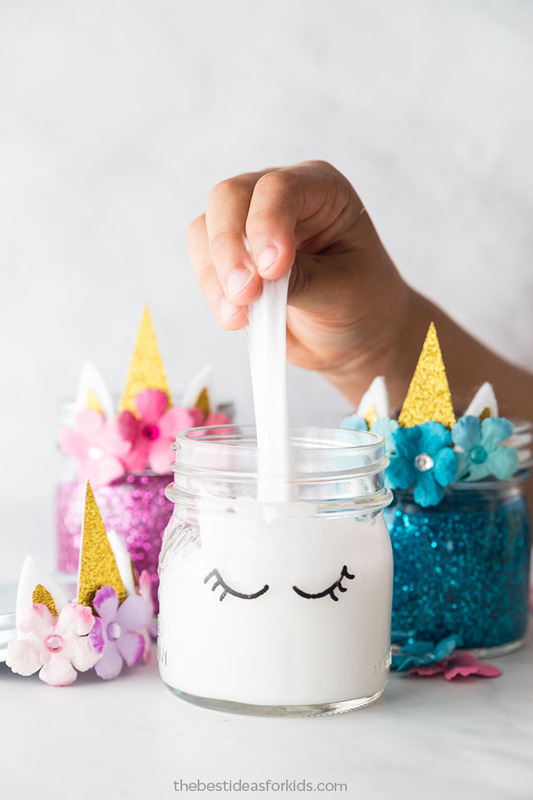 We’ll walk you through how to make this simple, stretchy white slime to put inside your unicorn mason jars. If you’d like to make the glitter slime instead, follow our Unicorn Slime Recipe. 2. Pour 6 oz of Elmer’s white glue into the bowl. 3. Add your 1/2 teaspoon of baking soda and mix. 4. Add 2 tablespoons of water and mix. Note – if you want the slime to be more stretchy you can add another tablespoon of water. 5. Add in 1 tablespoon of contact lens solution. Take this step as slowly as possible so you do not over-activate the slime (which makes the slime harder and not as stretchy). We like to add 1/2 tablespoon to start and then mix. Measure out the other 1/2 tablespoon and slowly add this in. Only add in as much as you need for the slime to pull away from the bowl. 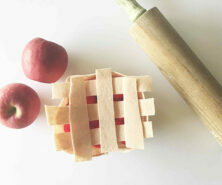 Take the slime out of the bowl and knead for 5-10 minutes. The slime will be very sticky still at this point. That’s normal! If you still find it too sticky after using the full tablespoon of contact lens solution, add some lotion to your hands and then knead some more. 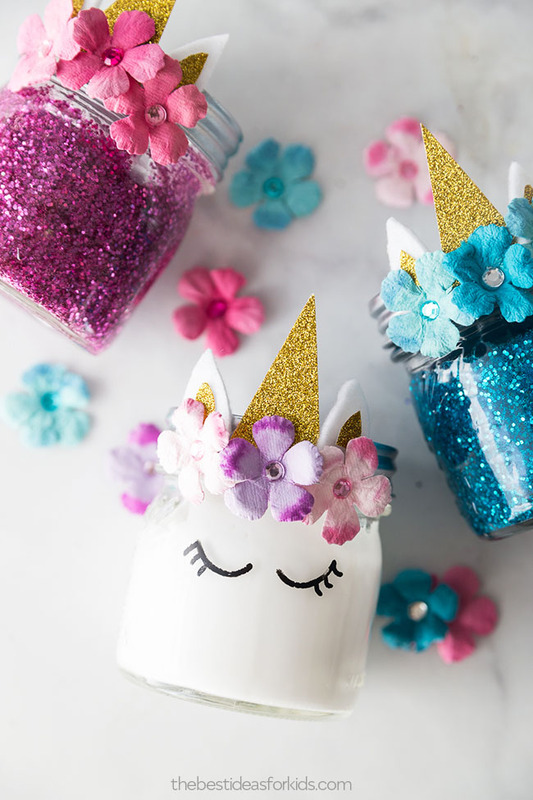 We hope you enjoy making these unicorn slime jars! You can use these unicorn mason jars to hold your slime and the slime should last at least one week. Just make sure the jar is air tight. Here are two of our other favorite unicorn slime recipes! This unicorn fluffy slime is so fun to make! It has a fluffy texture to it. 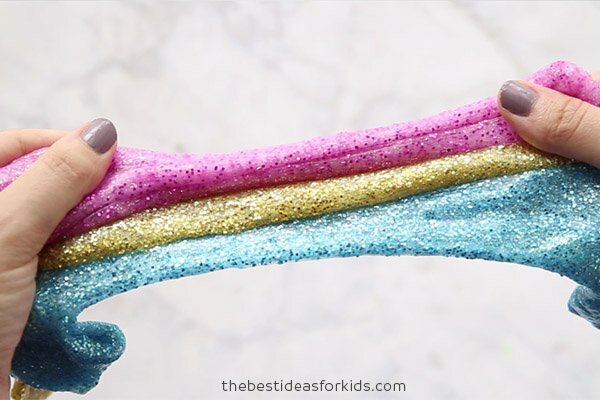 This unicorn slime is glittery and is made with pink, blue and gold glitter. If you want to make glitter unicorn slime see how to make it here. I love all of the slime. And I just love love the unicorn slime jars their sooooooooo cute!